It’s coming up, if you live down in Australia you do not want to miss it. Quidditch Australia and the Australian National University Owls are presenting the 6th annual Australian Quidditch Championships! That’s right you heard me! 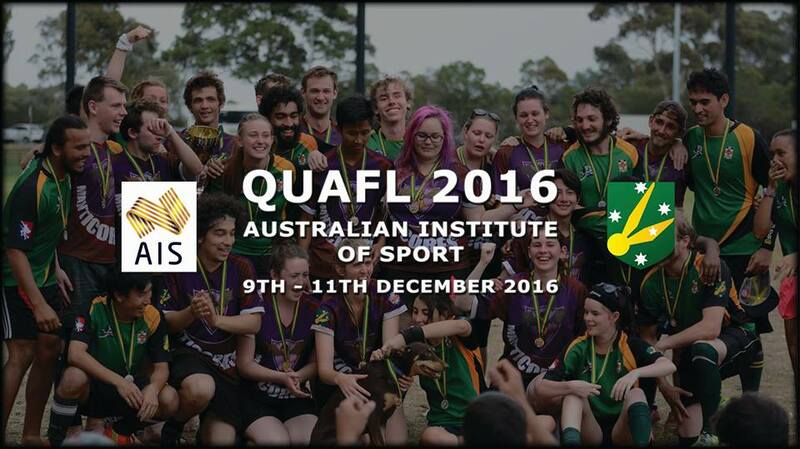 Six years Australia has been putting on their national championships and QUAFL 2016 promises to be full of fun, competition and the social event of the season! This year happening at the Australian Institute of Sport From Friday December 9th through to Sunday December 11th. Prepare yourself for not only an intense tournament comprised of over 20 teams from all over the country. But also a Quidditch Australia policies and Assistant refereeing workshop, Head Ref workshop and even a Snitch workshop! Check out this Information Packet for more details! The ref and snitch work shops will take place on Friday the 9th, while tournament pool play, finals and consolation games will take place over the Saturday and Sunday. Did you know that Quidditch Australia also has Wheelchair Quidditch? Also taking place, and before the ref and snitch workshops, on Friday, December 9th will be the Wheelchair Quidditch national championships. This will be the 5th annual wheelchair quidditch national championship, Western Sydney QC, UTS Opaleyes and Macarthur Weasley’s will each field full teams with three Merc teams being formed from the extra interested players. As if Friday alone wasn’t jam packed with all sorts of fun, and exciting events the Quidditch Australia General Meeting will also happen later on in the day as well! All are welcome to attend, though only club and state reps may be involved in the proceedings. I know what you're wondering, but where do I go to be involved or even just watch all the fun? QUAFL 2016 (with the exception of the QUAFL Social) will take place at the Australian Institute of Sport in Leverrier St, Canberra, Australian Capital Territory 2617.